It is not a secret that secondary education can cost an individual their lifelong savings and more. Most students are dependent on being granted loans to pay for college, even in addition to government financial aid and merit scholarships. In fact, the average American student graduates college with about $25,000 in student loan debt, meaning they will have to pay about $280 each month over a 10-year period (“Budgeting”). Now, what some people might dismiss is the interest rate for student loans repayments. With that same statistic in mind, remember that the student still has to pay back that interest amount as well. According to a financial website called College in Colorado Money 101, student loan interest rates are - on average - 6.8% (“Budgeting”). Paying back an initial loan for college plus that whopping 6.8% interest rate is hefty, which is why it is important to understand the economy at large, as well as the interest rate effect. In addition, knowing how aggregate supply and demand impacts the nation’s purchasing power after college is crucial, simply because the interest rate of the student loan is continuing to rise. This is negativity for individuals that have passion for learning and a personal need to attend a secondary education institute. As just previously mentioned, we all know that college is insanely expensive and it needs to be paid for somehow. Yes, parents, financial aid, and scholarships help, however, that is not nearly enough help in 2018. As of January 2018, there are “44.2 million Americans with student loan debt” (“A Look”). The numbers are skyrocketing, and the interest rates are following that trend as well. For example, according to an article on TIME Magazine’s website, “The interest rate for undergraduate students is 4.45% for the 2017-18 school year, up from 3.76% for the current year. Graduate students can borrow at a rate of 6%, up from 5.31%. And for graduate students and parents who take out PLUS loans, the interest rate will be 7%, up from 6.31%” (Mulhere). See the image to the for a visual representation of the increasing rates. 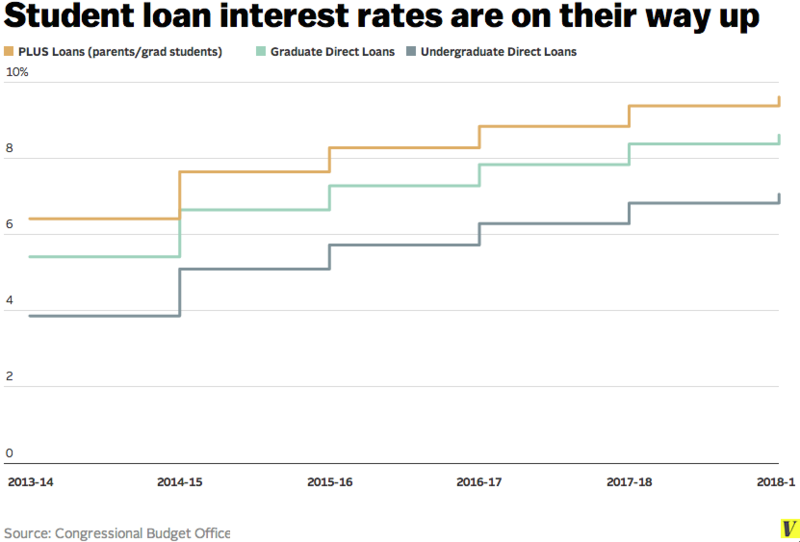 These numbers are staggering and the interest rate effect states that the borrowing cost is increasing because the price level of the economy is increasing, but students need the loans at that moment to afford their education. There is not waiting or holding back, which can be a difficult situation during a certain point in the nation’s economic state. According to an article published on CNBC, “Inflation is accelerating and may well push interest rates higher, allowing the fed to move policy rates three times this year, and perhaps even four” (Dickler). While the United States economy is doing better than in previous years, young adults are not looking forward to paying a potential 6.0%+ interest rate after already spending thousands on college alone. However, due to demand for education and the fact that many careers require post secondary education, people consider it a necessity to pay these increasing interest rates even though, according to aggregate demand, their money is not going as far. 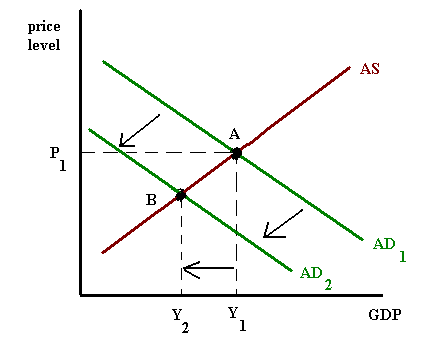 You see, if the government and banks increase their interest rates on student loans, the aggregate demand curve will actually shift leftwards (see image) simply because the consumer’s money is not going as far. This is called a demand shock. According to an ACDC video specialized in aggregate demand, Mr. Clifford states that when this happens, it is due to inflation, meaning that the price level is increasing and people do not want to spend as much (ACDC). However, students will spend that money because they want to succeed post high school and post college. Student loans are a hassle, and these increasing 6%+ interest rates do not help these poor college students. There needs to be a sudden change in these rates because as the price level begins to increase more, those interest rates will do the exact same. Borrowing money for college is not the same as borrowing money for a material good; it is a necessity for some and the interest rate effect is not helping for the overall aggregate demand of the nation’s individuals seeking further education. ACDC Leadership. “Macro 3.1 - Aggregate Demand Practice.” YouTube, 2 May 2014, https:// www.youtube.com/watch?v=l6Udc6uDX8o. “A Look at the Shocking Student Loan Debt Statistic for 2018.” Student Loan Hero, 24 Jan. 2018, https://studentloanhero.com/student-loan-debt-statistics/. “Budgeting for Student Loan Repayment.” CollegeInvest, 2012, http://www.cicmoney101.org/ Articles/Budgeting-for-Student-Loan-Repayment.aspx. Dickler, Jessica. “What You Need to Know About Rising Interest Rates.” CNBC, LLC., 17 Feb. 2018, https://www.cnbc.com/2018/02/16/what-you-need-to-know-about-rising-interest- rates.html. Mulhere, Kaitlin. “The Rate for Undergraduate Student Loans Is About to Climb to 4.45%.” TIME Inc., 11 May 2017, http://time.com/money/4774325/student-loan-interest-rate -increase-2017/. I think this is a great topic -- college loans are a pressing concern for thousands of students every year. Often it is assumed that wages will follow interest rates, which would allow students and families to pay off their loans; however, the effect of sticky wages results in a gap between growth of wages and the inflated interest rate. The pressing issue of rising college tuition rates is very relevant to many students looking to attend a postsecondary institution. The situation you describe is a perfect example of how a rising price level correlates to a rising interest rate, since the increasing cost of college results in students needing more loans and causes the interest rate on loans to increase. It would be interesting to graph this situation using long-run macroeconomic equilibrium. From a long-run standpoint, there would definitely be a leftward shift of the aggregate demand curve, assuming that the price of college continues to increase, causing people to become pessimistic about an inflated price level. Maybe the government would use fiscal policy to increase government spending or decrease taxes to manipulate the demand curve by shifting it rightward and restoring equilibrium at potential output. Or, a more advantageous approach would be to lower the overall price level of college, which would stimulate a reduction in interest rates on loans. Can Student Loans Now Be Discharged In Bankruptcy? In order to have a student loan discharged through bankruptcy, an Adversary Proceeding (a lawsuit within bankruptcy court) must be filed, where a debtor claims that paying the student loan would create an undue hardship for the debtor. Read More Can Student Loans Now Be Discharged In Bankruptcy? Incred offers education loans up to Rs 1 crore at attractive interest rates & flexible repayments. Check your education loan eligibility & apply for education loan online! Get Unsecured bad credit loans online with instant decision even with poor credit. It is possible to get an Unsecured bad credit loan even if you have bad credit. Taking a loan from a bank may be difficult and could be a matter of long process no matter even if it is a personal or commercial loan. If you need a personal loan then you may be able to find a lender who offers short term cash loans. In the most flexible way and easily. Thank you for sharing such great information. User can read more about loan and insurance at loan headline. If you are in short on cash and you need help cash urgently, you may find a lender who offers hassle-free emergency cash loans online. They work with many money lenders, which made the process easier. There are no hidden charges applicable to the services they provide. Are We at Full Employment? Why Would you Host the Olympics?